MJ Rowles carry a large range of different style retianing wall block systems. Please browse the different tabs below to see what suits your needs. Gardenstone Wall Blocks are basically a smaller version of our Norfolk™ Wall, at a slightly lower price. Gardenstone™ blocks are approximately 60% smaller, with 35 blocks per m2. As with the Norfolk™ block, Gardenstone™ blocks are made with hollow blocks for the bottom courses, lighter and easier to handle, and with a solid capping block. 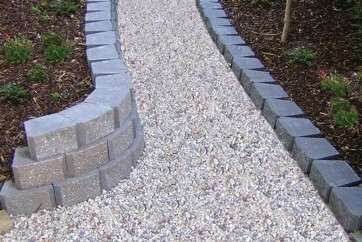 The smaller size of the Gardenstone™ blocks makes them ideal for lower retaining walls and garden edging and more suitable for tighter curves than other products. The Norfolk™ Retaining Wall Block System is an attractive Interlocking Wall System which has the natural look of quarried stone and blends into any landscape situation with its sculptured rock face texture. Developed specifically for Retaining Walls the Norfolk™ Blocks can be built straight, curved or terraced to fit into the contours of the embankment. Each Block is made of high strength, permanent low absorption concrete which are solid and maintenance free. Wall heights can be achieved to 900mm without reinforcement or engineering (subject to local council requirements). 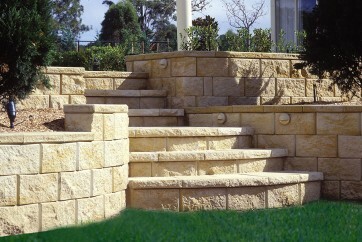 The Tasman™ retaining wall system incorporates purpose made corner and capping units to provide classical reconstructed sandstone retaining walls. 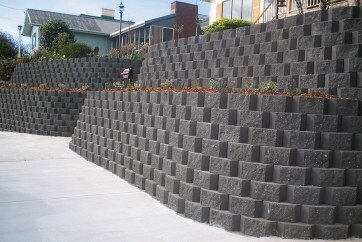 The unique design of the Tasman wall system allows increased flexibility over competing products. The Tasman walls can be built almost vertical. Each block has only a 10mm setback, which allows all available space to be utilised to the maximum. Curved or straight walls can be erected and it is easy to build 90-degree corners with the purpose made corner blocks. A capping unit is adhered to the top course of blocks to finish off the wall. The blocks are easily dry-stacked and their patented design locks into the block above to form an attractive structural retaining wall. For walls over 660mm high, FORTRAC® geogrid is locked in every 2nd course of blocks to create a reinforced soil retaining wall structure. (See Design Tables). Seek specific engineering advice for walls over 660mm high, walls carrying car traffic or to comply with most council requirements. The Tasman™ system is manufactured with a water repellent admixture to add to its quality.